We've got big news today: we're launching a new partnership with Microsoft, a global technology leader and a long-standing supporter of the law enforcement community. Because of this partnership, agencies will be able to deploy Axon's Evidence.com on Microsoft's Azure GovCloud starting in 2016. When we evaluated who would be the best long-term partner to provide the core infrastructure to support our Axon platform, the answer was obvious—Microsoft. Our companies align in many ways, but most importantly, we share a forward-looking approach to technology, a relentless commitment to data security and compliance, a global scale, and a customer-oriented approach to developing solutions. We're better together. By joining forces, we're paving the way for law enforcement agencies to get the most out of today’s leading technologies. Axon solutions, including body-worn and in-car video systems, are changing the face of law enforcement and allowing agencies to work smarter and faster. We focus relentlessly on the “backend” management of data, combining video capture, tagging, searching, redaction and sharing in a single, secure, end-to-end digital platform. The end result: law enforcement and legal partners can seamlessly manage all types of digital evidence from capture to courtroom. Microsoft’s cloud platform and mobile devices are the perfect foundation for this back end. They provide a scalable, reliable and trusted environment that enables the collection, management and storage of data. Together, our platforms free law enforcement agencies from the burden of IT administration and provide fast, easy access to massive stores of critical data while maintaining strict compliance standards. Both Microsoft and Axon have a global reach, and we're both committed to providing international customers with superior cloud solutions. Microsoft cloud services are available to law enforcement agencies around the globe, and are highly scalable to accommodate agencies’ growing data storage demands from video and other data-intensive devices. By storing video and other evidentiary data in the cloud, police departments can avoid the cost and complexity of IT administration and spend more time focusing on public safety. Most importantly, we both share a long history and commitment to the needs of law enforcement. Axon's hardware devices and software platform have been developed with extensive customer input, and law enforcement officers receive in-depth training on how to use the products on the front lines to defend citizens, protect officers, and ensure public safety. Q: When will customers be able to purchase or use Evidence.com (http://evidence.com/) or Axon products integrated with Azure? 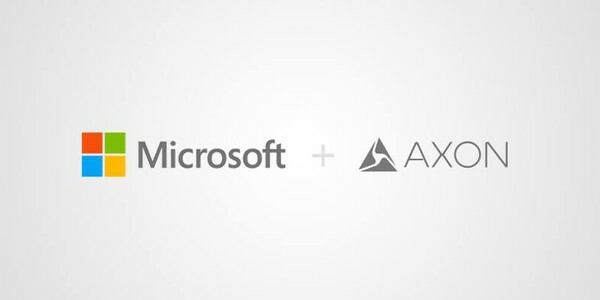 A: Axon’s Azure integration is expected to be publicly available to all agencies in early 2016. Q: Will there be a change in cloud pricing for Axon customers? A: No, customers will not see a change in pricing as a result of this partnership. Q: Will Axon still support customers who prefer to stay on a different cloud infrastructure? Q: What Microsoft solutions will be involved? A: We'll be deploying our platform on Azure GovCloud. In addition, we'll be taking advantage of the opportunity to integrate with many of Microsoft's other products and services, including integration with Microsoft's Active Directory to ease the user sign-in process. That’s just the starting point—we think we’ve got lots of opportunities to work with Microsoft on everything from their new HoloLens technology to applying their leading work in text and video analytics to some of our customers’ most pressing challenges. Want to Learn More About the Partnership? View a recording of our recent webcast, download the presentation slides and a fact sheet here.